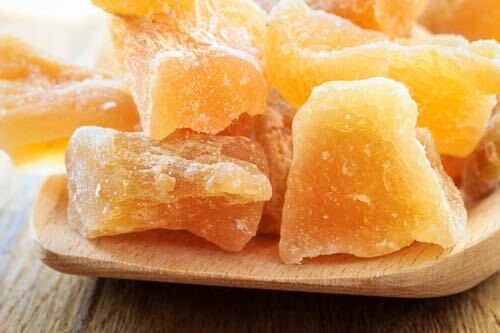 Try a ginger candy recipe from Grandma's collection and make deliciously old fashioned crystallized candy with the distinctive flavor of fresh ginger. Experience the unique and delicious taste of a historical candy. Muffin pans work great for the buttered tins called for in the old fashioned recipe that makes around 2 dozen candies, depending on your pan size. Take 1 cup of water to 1-1/2 cups of sugar, and boil just until when tested it will roll into a small ball. Flavour to taste with essence of ginger or powdered ginger. Rub some of the syrup against the side of the pan with a wooden spoon until it turns white, then "quickly" pour into buttered tins and put in a cool place. 1 envelope Knox® Gelatine, 1/2 cup cold water, 2 cups granulated sugar, 1 cup boiling water, 1/2 cup crystallized ginger cut in small pieces, 1 tablespoonful lemon juice. Soak gelatine in cold water ten minutes. Put sugar and boiling water in saucepan, place on range, and when sugar is dissolved add soaked gelatine. Bring to boiling-point and let boil fifteen minutes. Remove from range and add lemon juice. Turn into pan dipped in cold water, having mixture three-fourths inch in depth. Here's a short 10-minute YouTube video that not only demonstrates how to make crystallized ginger candy, but shows you how to combine the leftover ginger syrup with club soda to make refreshing homemade soft drinks. Ginger has long been a favored flavoring ingredient for confectionery. In seventeenth century England, throughout the reign of the Stuart monarchs, people ate liberal quantities of sweetmeats both for pleasure and for supposed healthiness. Sweetened medicinal lozenges, many containing ingredients of questionable health benefit, were routinely taken to cure a wide variety of legitimate and doubtful disorders. Ginger was a favored ingredient, as it tended to sooth the stomach and had a pleasing taste. Around the same time, over in the North American Colonies, sugar was used in homes mainly for medicinal purposes and for sweetening tea. It was seldom used for confectionery purposes. Oddly enough, candy was to retain its association with medicine up until the middle of the nineteenth century. Ginger lozenges and candies were described as "carminative and stomachic" and "useful in flatulency and loss of appetite." So, choose a ginger candy recipe and make yourself a treat that's not only delicious, but it's good for you too!